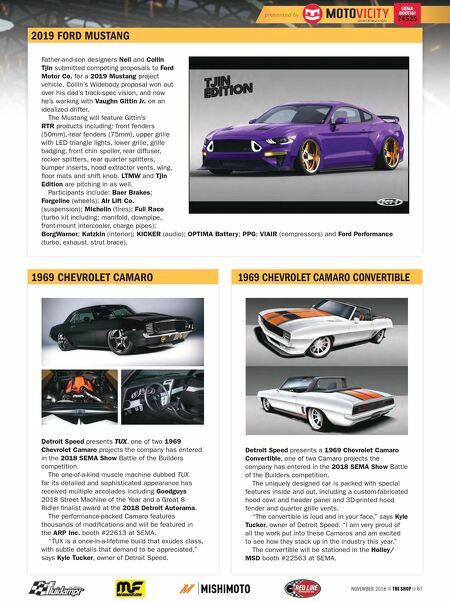 66 THE SHOP NOVEMBER 2018 Consider project vehicles an introduction—an introduction to new products, new designs or a new take on a classic approach. The SEMA Show and other events are the places to see the latest innovations come to life on amazing projects that spark the imagination. Even if some of the concepts aren't always attainable for the masses, they often spur ideas that trickle down to everyday consumers. Designers are excited to introduce their newest projects on the following pages. When you see one of these vehicles in person, be sure to stop and stare. Consider it an introduction to tomorrow's trends today. Moving the industry forward. 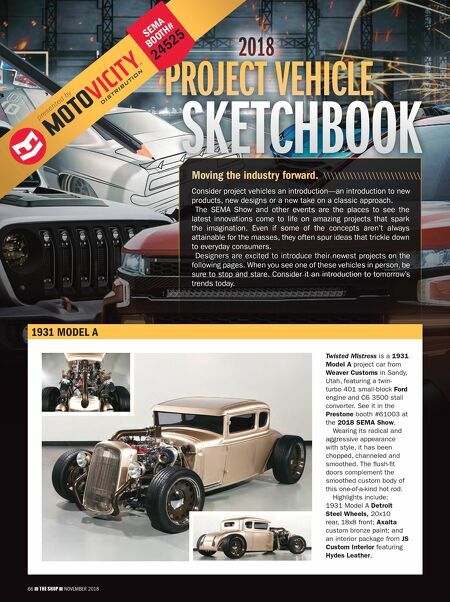 66 THE SHOP NOVEMBER 2018 SKETCHBOOK 2018 PROJECT VEHICLE \\\\\\\\\\\\\\\\\\\\\\\\\\ 1931 MODEL A presented by SEMA BOOTH# 24525 Twisted Mistress is a 1931 Model A project car from Weaver Customs in Sandy, Utah, featuring a twin- turbo 401 small-block Ford engine and C6 3500 stall converter. See it in the Prestone booth #61003 at the 2018 SEMA Show. Wearing its radical and aggressive appearance with style, it has been chopped, channeled and smoothed. The flush-fit doors complement the smoothed custom body of this one-of-a-kind hot rod. Highlights include: 1931 Model A Detroit Steel Wheels, 20x10 rear, 18x8 front; Axalta custom bronze paint; and an interior package from JS Custom Interior featuring Hydes Leather.